We all know that breakfast is the most important meal of the day. Go through these quick steps to make sure you are on the right track and doing justice to your breakfast. 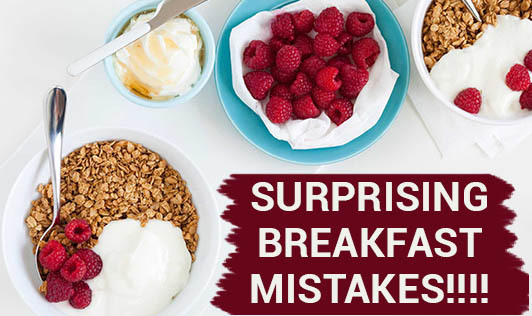 • Avoid short cuts like substituting a wholesome breakfast with energy bars. Although they have some healthy grains in them, they are loaded with sugars. • Fruit juices, energy drinks and many flavored coffee creamers are often packed with sugar. The fact is that stored juices have sugars, preserves and processing agents in them that deteriorate the quality of your meal. • Give up on your coffee to boost your mind and brain function. Look for natural ways to stimulate your mind. If you drink coffee/tea regularly, restrict yourself to one cup a day. • If you're often in a rush to get to work, and skip breakfast, stock up on healthy snacks. The key to healthy eating is planning ahead. • Don't leave your house without drinking one big glass of water. This will keep you hydrated. • Choose whole wheat/multi grain bread products in the morning to have a great start. • Whole grains will help you stay fuller for longer plus they have more fiber which will slow down your craving for the day. • Keep nutritious, non-sugary pick-me-ups in your desk drawer/bag/office fridge. Keep these points in mind throughout the day, and you'll be on your way to healthy weight loss in no time! And if you still have any queries about your diet, get in touch with your Step up to life nutrition expert to get your personalized diet plan.